Thursday evening Orange Coast College President Dr. Dennis Harkins and his staff held an informational meeting on campus to attempt to bring interested parties up to speed on the progress of the planned more than $600 million expansion as presented in their original plan, Vision 2020, HERE, and now being fleshed out in preparation of the Environmental Impact Report (EIR). There were around 50 people in the room, including OCC staffers and members of the Orange County Fair and Event Center Board. New OCFEC CEO Kathy Kramer, former interim CEO Doug Lofstrom and board member Stan Tkaczyk sat off to the side, observing and participating when asked. 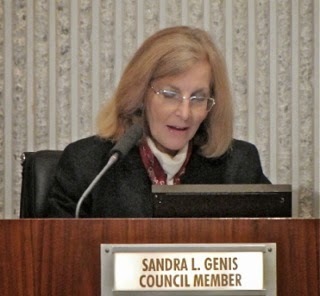 Costa Mesa Councilwoman Sandra Genis attended and lent her expertise as a land planner and EIR expert. Coast Community College District Trustee Mary Hornbuckle and former Costa Mesa Councilman Jay Humphrey were among us in the small crowd. 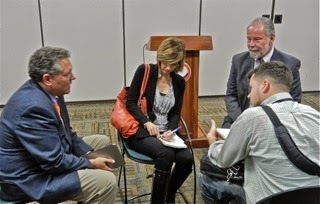 The real media was represented by Nicole Shine of the Daily Pilot and Jordan Graham of the Orange County Register. Harkins kicked off this third community meeting - the previous two were held last summer - by telling the assembled group that he had expected to be finished with this process by now and had hoped to have the completed EIR and his staff recommendations to the Coast Community College District Trustees by now, but there were complications, including the identification of certain historical buildings that may occupy up to 40 acres of the 160 acre campus site. That may cause a change in plans. He explained that the California Environmental Quality Act (CEQA) requires significant study of projects such as the one proposed. Parking Structure - There is an issue with an $8 million pedestrian bridge proposed by the City of Costa Mesa, which includes complications with Edison power lines. State Funding - No statewide funding measures were on the November ballot - a rarity, and one that complicates the fulfillment of this project. Historic Buildings - Certain buildings on campus - those designed by Master Architect Richard Neutra - have been identified as having historical significance. 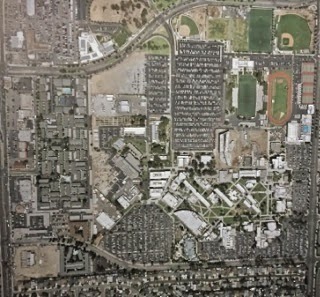 They may take up a quarter of the campus footprint, which will cause some serious re-thinking of the plan. The OCC Village - A consultant has been retained to assist with this segment of the plan. Pagel told us that the studies are on-going and it is hoped to get the CEQA document to the Board of Trustees by April. That will be preceded by yet another community meeting at which time many questions will have been answered and more community input will be gathered. 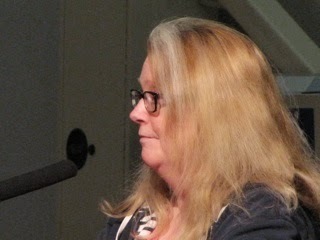 Harkins then took back the microphone and expanded on some of the issues. 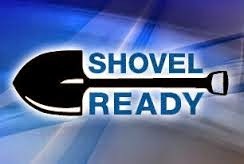 He told us that there are two projects virtually "shovel ready". Those are the expansion of the Recycling Center - the last remaining such facility in the City - and a new Planetarium. He then fielded questions, but many of those were unfulfilled. We were told this was not a CEQA meeting, and that that process is ongoing so many of the questions could not yet be answered. A good deal of frustration was expressed by many attendees, as they attempted to pin down Harkins and the staff on issues important to them. At one point Hornbuckle made her way to the front of the room, took the microphone and calmed things down. In her own special way she explained the process and that this is a very long range plan so it's taking time to get it right. She emphasized that what we see in the plan now may not be the final version. As the CEQA document is completed and the staff assesses the information it's likely that some elements currently in the plan will be either modified significantly or dropped altogether. There was a point where the issue of student input was brought up, at which time Lisa Meyer - who identified herself as a student and a "regional delegate" - stepped up to explain her views on things like the proposed 145 room hotel on the plan. She explained that it would be used as a training ground as part of the renowned Hospitality program, with students learning by doing. Although Harkins, Hornbuckle and the staff seemed uneasy with her stepping up to speak - citing that she had not been "prepped" - Meyer did a fine job and received a round of applause from the crowd. So, the upshot of this meeting was that not too much new was learned about this enormous project, particularly by those who had attended the previous meetings. Several studies are currently underway which will, hopefully, provide some answers. We learned that we get another shot at this issue in April, before the CEQA document is presented to the Board of Trustees. In the meantime, Harkins and his staff encouraged members of the public to be in touch with them with their concerns/input. At one point someone mentioned that 28 letters had been received by concerned individuals. We now mark time until the April meeting. A reminder for you... Thursday, February 19, 2015 beginning at 6:00 p.m. in the Student Center, Orange Coast College will host a community meeting to present information on Vision 2020, their Master Plan for upcoming development on the campus. This is a huge undertaking - new buildings, a four-story parking structure, retail/restaurant center and a 145-room hotel - and represents an expenditure of more than $600 million! You can read the entire 140+ page document HERE. This is going to be very important to the entire community, but especially so for those segments nearby to the campus. 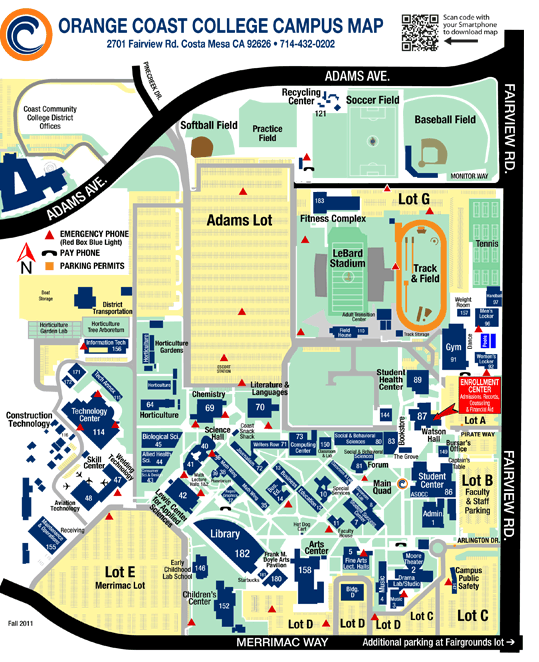 The Student Center is adjacent to Parking Lot B on this map. See you there. Click on the image to enlarge it for easier viewing. The meeting began with the introduction of the new command staff of our adopted Marine group at Camp Pendleton - the 1/5 Marines. Lt. Col. Mark Carleton, Sgt. Major Anthony Pappas and Lance Corporal Ashley Ramirez of Costa Mesa represented the group. 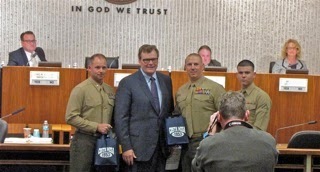 Mayor Steve Mensinger mused that he was a "Marine wannabe" during the presentation. 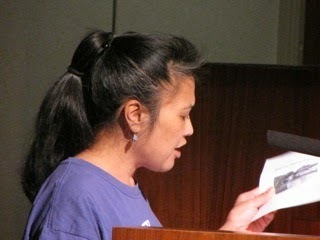 During Public Comments an even dozen speakers rose beginning promptly at 6:00 p.m. and spoke on a variety of issues. 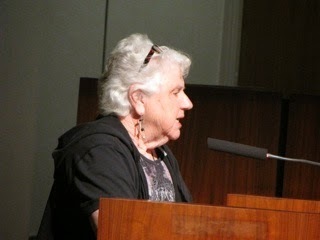 A woman representing Residents for Responsible Desalination in Huntington Beach - an anti-Poseidon group - told us of a town hall meeting in that city at Eader School, 9291 Banning Street (between Bushard and Magnolia) on Thursday, March 5th from 7-9 p.m. at which information will be presented about the proposed desalination project in that city. response to problems they were creating, plus he spoke about new curbs and sidewalks on Industrial Way. He was also concerned about the skate park being unattended, and suggested we have a staffer at the site. 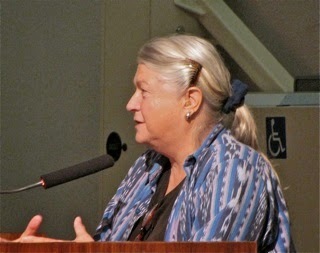 Beth Refakes complained about the scheduling of city meetings and other community outreach meetings, using the example of the meeting in Mesa Verde regarding a proposed development that was being held at that very time. She asked for better communication between the City and other entities. 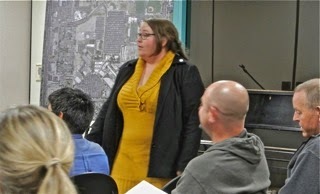 She also asked that the city consider holding the community budget workshop as has been done in the past. She also wondered about the project for the terminus of the 55 Freeway and commented about the 1/5 Marine Command Staff. 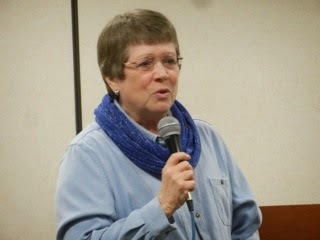 Gay Royer talked about the Coffee With A Cop event that morning and the 1/5 Command Staff. She also observed that we need to do more to help veterans. improve the Police Department staffing situation, and wanted to know, specifically, what they had done. He also complained about the meeting time conflicts. Teresa Drain, once again, requested a forensic audit of the 60th Anniversary Celebration, and provided several examples of why one is necessary. wondered about the sober living applicants - only 11 have turned in applications so far and wondered when something will be done for facilities in R-2 zoned areas. She also complained that the CAD RMS system is not working and that the residents deserve to know the crime stats. Debbie McGuire complained about living in fear in College Park due to increased numbers of transients and begged the council to do more to make us safe. 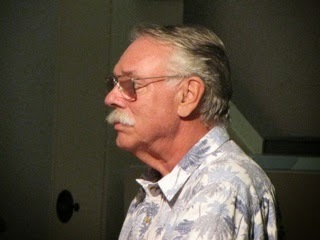 Gene Hutchins, once again, spoke of the unfunded pension liability issue. A member of the Pension Oversight Committee, he told us very little can be done except reduce the budget through staffing cuts, raise taxes or file for bankruptcy. Ann Parker said the honeymoon is over with the new council and she's ready for a divorce. She expressed curiosity about Righeimer's Israel trip. 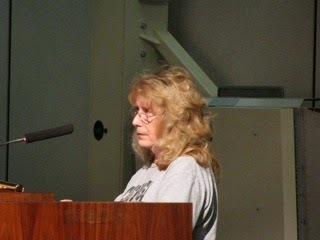 She also complained about the sober living homes and asked the council to "get it together and do something!" James Bridges greeted Interim Police Chief Ron Lowenberg, with whom he apparently has a history dating back to their time in Huntington Beach. He addressed pension spiking. He complained that he had not been selected for city committees and observed that the council is doing what they do best - nothing. 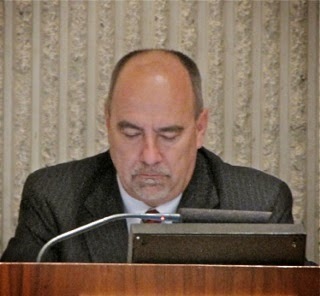 Laurene Keane agreed about the forensic audit of the 60th Anniversary celebration; indicated that Irvine and Newport Beach are doing something about their pension situation and wondered why city staffers or council members had not attended a recent conference on sober living homes. She also expressed concern, again, about the lack of an Economic Development Plan. She finished precisely at 6:30 p.m. Rookie Mayor Steve Mensinger began by asking CEO Tom Hatch to follow up on several items of concern to residents. He thanked Refakes and others who are on the Military Affairs Team for their efforts on behalf of the 1/5 Marines. He told us he and Hatch had spent four and a half hours at Lions Park observing the transient population recently. Seems like a mighty long time to stand around observing homeless folks. You can circumnavigate the entire park, counting as you go, in about five minutes. 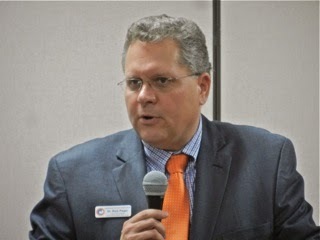 Regarding the Pension issue, he observed - in another of his overstatements - that no other group in Orange County understands the problem better than the Pension Oversight Committee, but that we don't have the tools to fix it. 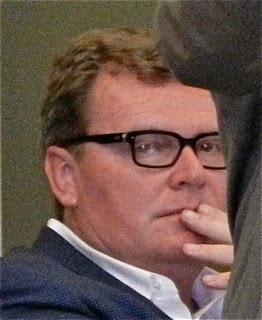 He told Bridges that he will look into him being shunned for committee appointments. Really? New Year celebration; TET Festival at the Fairground this weekend; suggested we get an update from Mesa Water about the Poseidon project; Costa Mesa High School has a new Football Coach (her boys play football at CMHS). She concurred with McGuire about safety due to aggressive transients, which she described as younger and scary. She wanted an update on the CAD RMS situation and wondered when we would be able to get back to community policing, and hoped the new chief could help us with that. She expressed concern about Prison Realignment. She's meeting with Teresa Drain to go through "two large banker boxes" of information on the 60th Anniversary Celebration next week. She asked Hatch to make the Economic Development Plan a priority and wondered about how the new developments around the city and their impact. 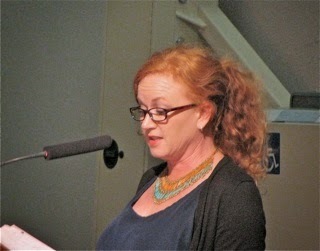 And, she told Perry that an attendant at the skate park would actually increase the City's liability problem. Sandra Genis wondered about the Poseidon project, and observed that at one time it was scheduled to tear up a large chunk of the City for its pipeline. 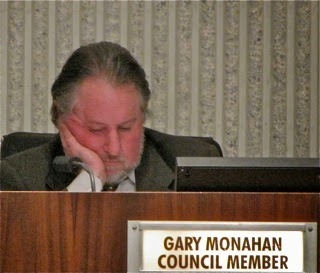 Gary Monahan had nothing to say.... again. Righeimer welcomed Lowenberg and complimented Captain Rob Sharpnack for stepping in as acting Chief. Regarding Poseidon, he told us that nothing is coming to Costa Mesa from that project - nothing would be torn up because the water would be piped north instead of south. 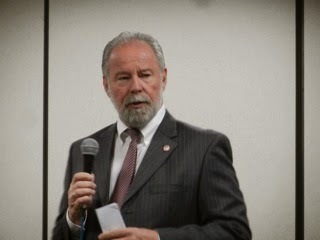 He then launched into a long speech about pensions, complaining about CalPERS rates and, in response to a speaker's earlier observation about Newport Beach doing something, he referred to that city as "the 1% of the 1%", apparently implying that they could pay down some of that debt because it is a wealthy city. He then reiterated that he was "not looking to pay one penny more than is required." Please refer to Hutchins' observation, above. On the sober living issue he mentioned a community meeting at College Park Elementary School on March 4th, from 6-7:30, which he apparently will be attending. I've seen the announcement for that meeting - Foley and Mensinger are also attending, as is a large entourage of city staff. And, it conflicts with the Fairview Park Citizens Advisory Committee meeting and Righeimer is council liaison for that group. He ended his little rant by stating that his personal vacation is nobody's business. Hatch observed that the budget study session scheduled for next Tuesday had been cancelled, stating that the issues they had planned to deal with would be handled another way - whatever that means. He told us that there is a meeting of interested parties for the Library/Community Center at the Community Center at 6 p.m. on March 5th. 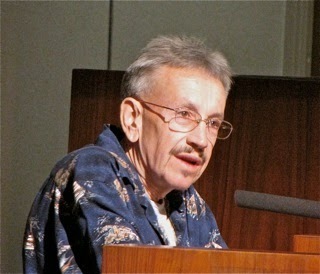 He welcomed Lowenberg and praised him for his body of work. He told us the CAD RMS system is up and running, but has some problems to iron out. It's interesting to note that although this issue has been brought up many times recently, we've never heard from Steve Ely, the man in charge of Information Technology on the subject. He spoke of the homeless problem and told us that he and the senior staff held a meeting in the park recently for an hour and came up with some good ideas. Apparently one of them was to remove the "wing panels" in the restrooms because people could hide behind them. Geez! That's right up there with spending tens of thousands of dollars to demolish the dining pavilion because homeless folks hung out there. He told us we have a new park ranger and will have two rangers assigned to Lions Park for awhile. He addressed the Economic Development Plan issue by praising the Chamber of Commerce, South Coast Plaza, The South Coast Alliance and the Convention and Visitor Bureau. Regarding the Police Staffing issue, he referred to a draft copy of a 4-page document addressing it, which he will give to the council (but, apparently, not the public). In a line that sounded like it came straight from the script of Kevin Costner's movie, The Postman, he said, "good news is happening every day." Well, that's just great! Tell that to Debbie McGuire, who is petrified to live in her neighborhood! Tell that to the Westside neighbors who are seeing gang activity increasing every day. He said we have several officers in the academy, with graduation dates stretching from March to June. He finished just after 7:00. Four items were pulled from the Consent Calendar, #7, the Street Sweeping Contract, and #9, 10 and 11. New Business #1, the request to increase the Senior Commission from 5 to 7 members got a little conversation. 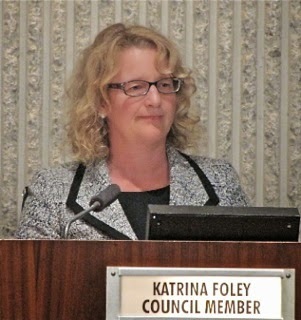 Foley wanted to increase it to 9 members, but the council ended up voting unanimously to increase it to 7. New Business #2 was the authorization to send Mensinger and Hatch to Washington, D.C. to a League of Cities conference from March 7-11. The cost would be $2,500. Discussions included the lack of clarity about the agenda for the conference and who was paying for it. 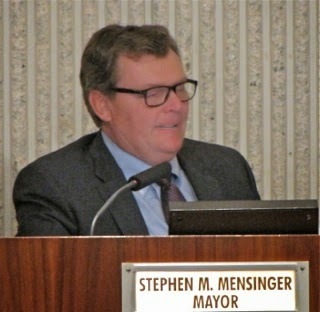 Mensinger said he didn't think the taxpayers should foot his bill, so he was paying for it himself, and he muttered something about having to "take vacation days" for the trip. Geez! Too bad, dude! That's what you signed up for, for goodness sake! In the end they approve the item unanimously, amended to include Mensinger reimbursing the city for his costs. Personally, I think if the council agrees this is a worthy cause, then the city should pay for both Hatch and Mensinger to attend. New Business #3, the reinstatement of our membership to the California League of Cities, took a lot more time to flesh out. 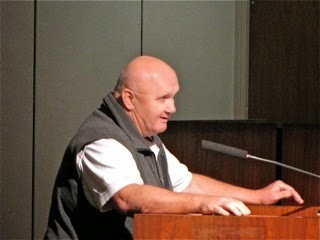 During the discussion Righeimer grilled Tony Cardenas, regional representative of the League of Cities, on many issues. He questioned the effectiveness of their advocacy, flat-out stating that the organization was for big government. Foley and Genis addressed the value of many facets of the membership, which will cost us nearly $26,000. Mensinger told us he was luke warm to it initially, but has since decided he's for joining up. Monahan said he'd go along with the Mayor because it's his call. 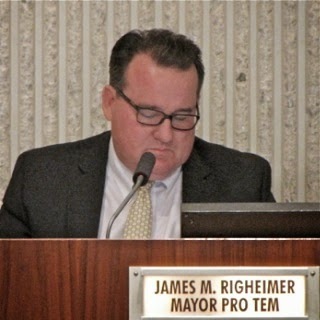 Eventually, nearly an hour later, it passed on a 4-1 vote, with Righeimer voting NO. The discussion of Consent Calendar item #7, the outsourced Street Sweeping contract, drew more discussion than I expected. 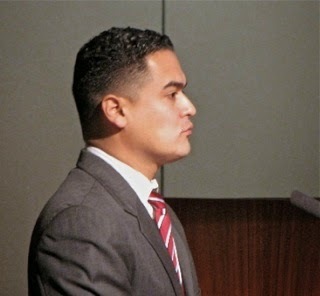 During the conversation Director of Public Services Ernesto Munoz said the cost savings would be $3.5 million over the life of the contract. Later Foley contradicted him, observing that it was more like $1.4 million for the first part of the contract, and that much of that was due to not having to purchase new machines. Mensinger observed that we wouldn't be paying into pensions for the contractors, either. Speaker Jay Humphrey pointed out that this decision was determined as a General Law City, not a Charter City, emphasizing that this kind of thing can be done with our present form of government. Foley observed that the employees negotiated to do this outsourcing and Righeimer complained that "we had to give something." Well, dude, that's what negotiating is supposed to be all about - give and take. His idea of negotiation is all take, no give. Eventually, the motion passed, 5-0. The remaining three, #9, 10 and 11 - all street/road improvement projects - were pulled by Humphrey to make a point about grant funding. They all passed, 5-0. The meeting ended at 8:30! The next meeting is on March 3rd. Well, the latest installment of Coffee With A Cop was another success. 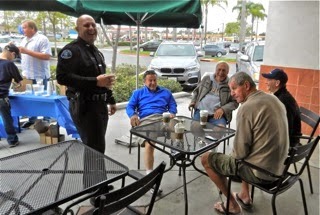 The good folks at Starbucks at 1170 Baker Street (which will soon be shuttered for renovations, according to posted signs) hosted the Costa Mesa Police Department and the good friends and neighbors who showed up for a free cup of java and conversation with a cop. 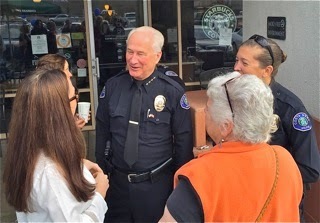 A special treat this time was the presence of new Interim Police Chief Ron Lowenberg, who came early and stayed late and took the opportunity to meet members of the community and to swap tales from his long and illustrious career. He made some new friends and rekindled some old ones, too. I didn't do a headcount - the number was fluid as folks came and went - but the turnout seemed to be fairly typical of previous events. Among those officials who attended were Mesa Water Director Jim Fisler and Costa Mesa Councilwoman Katrina Foley. A half-dozen officers were present for the two hours available - most off duty and serving on their own time to meet residents and answer questions. 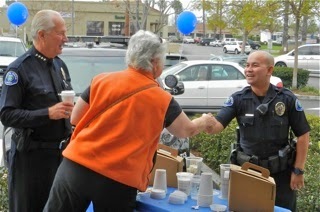 Among them was Officer Kha Bao, our most highly decorated DUI enforcer, shown here greeting resident Mary Spadoni. 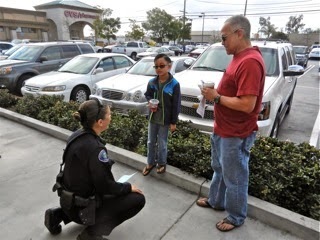 Officer Kris Cover engaged in an early recruitment effort in this image. Captain Mark Manley shared stories with some of the regulars at this Starbucks, where they meet daily to solve the problems of the world. 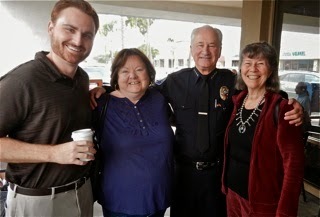 Here Chief Lowenberg schmoozes with resident, and former council candidate, Tony Capitelli, resident Teri Fuqua and United Neighbors newsletter publisher Diane Hill. While we're talking cops, the most recent DUI/Driver's License Checkpoint last Friday night, February 13, 2015, was successful, too. The event, which was in place at northbound Newport Boulevard at Flower Street from 8:00 p.m. - 2:00 a.m. showed the following results. This activity, funded by a grant from the California Office of Traffic Safety, through the National Highway Traffic Safety Administration, continues to prove it's value as an effective educational tool and deterrent against drunk or impaired drivers. 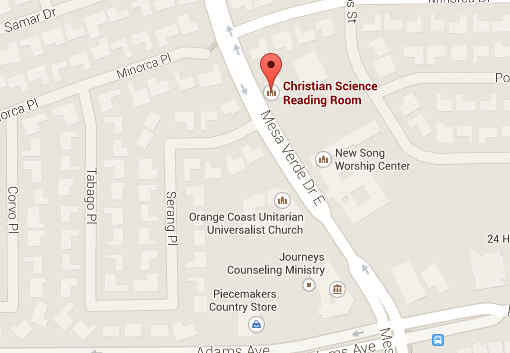 It's going to be an interesting meeting next week in Costa Mesa. After the City government takes the President's Day holiday off today, Monday, February 16th, Tuesday will make up for it. 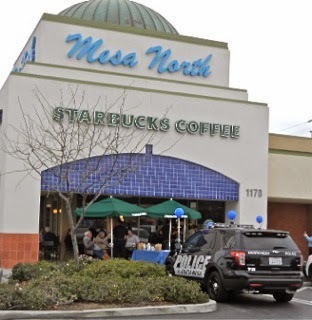 First, there will be the most recent edition of Coffee With A Cop at the Starbucks, 1170 Baker Street, Costa Mesa from 8-10 a.m. 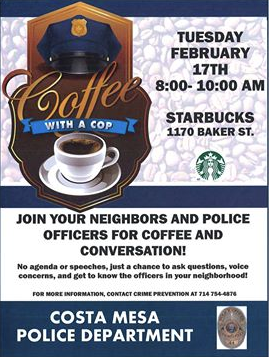 I've attended the others and it's a great time to stop by and meet members of the Costa Mesa Police Department and grab a cup of coffee. See you there. Later that evening there will be the next edition of the Costa Mesa City Council meeting, which begins at the new start time of 5:45 p.m. in Council Chambers. You can read the agenda HERE. 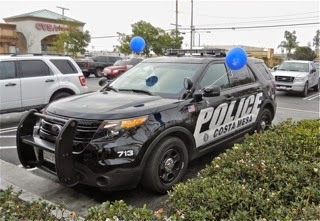 The open meeting will be preceded by a closed session beginning at 5:00 p.m. during which negotiations with the Costa Mesa Police Management Association and the Costa Mesa Police Association will be discussed. 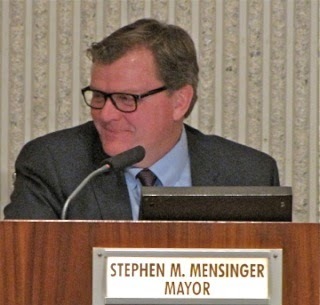 It will be interesting to learn whether Mayor Steve Mensinger and Mayor Pro Tem Jim Righeimer absent themselves from the former - we know they MUST not be included in the latter. The agenda looks like a fairly short meeting. There will be the introduction of the new Command Staff of the 1st Battalion/5th Marines during Presentations. CONSENT CALENDAR PACKED - AGAIN! There are seventeen (17) items on the Consent Calendar! You can review them on the agenda. Unless a member of the staff, council or the public pulls one for discussion, all will be decided on one vote. Jones & Mayer - $143,459.12 - A large list of legal charges. Steadfast Contracting, Inc - $16,639.34 - WiFi installation in Senior Center. Civil Source - $10,020.00 - Staff Support Services, Nov. and Dec.
Randstad Technologies LP - $9,360.00 - Temp IT Support Staff, Dec.
We continue to rack up serious legal fees and costs for temporary services for months at a time in jobs previously occupied by full time employees. Item #4, HERE, is a contract to perpetuate the existing transportation agreement with Western Transit to transport Seniors to and from various appointments. 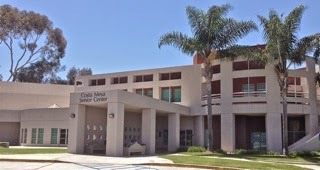 It involves the acceptance of a grant from Hoag Memorial Hospital Presbyterian Community Benefit Program just over $106,000 and a two-year contract with Western Transit not to exceed $213,419.70. Item #7, HERE, is a nearly $700,000, 5-year contract with three (3) optional one-year renewals with CleanStreet, HERE, for street sweeping services throughout the city. As a taxpayer, I kind of thought it might be important for the folks charged with spending our money to explain this contract instead of burying it in the Consent Calendar. Item #8, HERE, is the dissolution of the Orange County Fairgrounds Authority. Again, this item seems to be another curious choice to place on the Consent Calendar, where it is anticipated that no public discussion nor explanation of this action will occur. Item #15, HERE, is the modification of the Study Session Start Time from 4:30 to 5:00 as requested by Mayor Mensinger. Again, this seems like an item worthy of discussion since folks actually do attend study sessions, as witnessed by the budget study session last week. But, nope - this one is buried late in the Consent Calendar. Items #16, HERE, and #17, HERE involve the Successor Agency budget and obligation payment schedule. Again, the budget represents $125,000 of taxpayer dollars and the obligation payment schedule involves several million. One would have hoped for even a little brief explanation, but no - these items are at the end of a loaded Consent Calendar. Following the Consent Calendar the council will recess and reconvene as the Orange County Fairgrounds Authority for the purpose of dissolving the authority. The link to the staff report doesn't work, so we don't know much about it. Then the council will re-convene and deal with three (3) new business items. Item #1, HERE, is the resolution to add two more bodies to the Costa Mesa Senior Commission. It is unclear that, if the council passes this item, whether new members would be appointed immediately. I guess we'll find out. New Business #2, HERE, is the return of the item yanked from a previous council meeting agenda which involves sending Mensinger and CEO Tom Hatch off to Washington, D.C. for the annual National League of Cities Congressional City Conference, March 7-11. It will cost $2,500 from Hatch's slush, er, contingency fund. New Business #3, HERE, is a request to reinstate the City's membership in the California League of Cities, with a dues payment and surcharge for ongoing legal costs totaling nearly $26,000, which would also be taken out of the slush, er, contingency fund. This seems to be a matter of getting the cart back behind the horse - see #2. But that's not all that's going on Tuesday night! 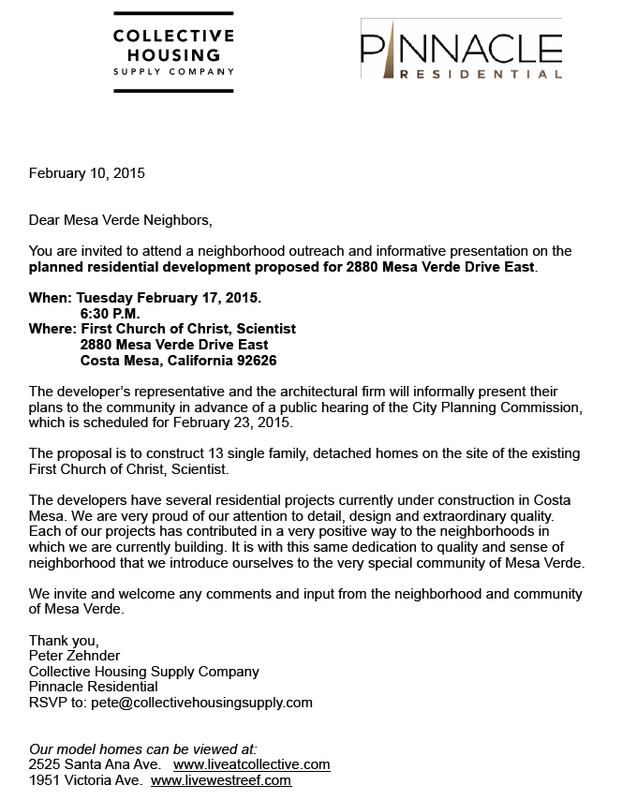 No sir, in a peculiar bit of scheduling, there is a community meeting at the site of the First Church of Christ, Scientist on Mesa Verde Drive where the developer invites neighbors in for a little chat about his plans to build thirteen (13) homes on that site. This issue goes before the Planning Commission next Monday night, February 23, 2015. The meeting begins at 6:30, so Mesa Verde neighbors interested in broader city issues as presented at the council meeting are going to have to deal with a serious conflict. Here's an image of the letter about that meeting. Click to enlarge it. Thursday, February 19, 2015, Orange Coast College will hold a meeting at the Student Center on campus, 2701 Fairview Road, to discuss it's $661 million expansion plan - Vision 2020. This plan includes new buildings, a four-story parking garage, a retail-restaurant center and a 145-room hotel. You can read the 143 page document HERE. This is a HUGE undertaking within our community and will have a very significant impact on a large section of our city, particularly the neighborhoods nearby.